A 71-year-old cancer patient from Australia named Len Chandler was facing an amputation below the knee before a 3D-printed heel bone implant helped him get back on his feet. 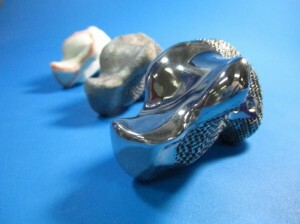 Chandler was diagnosed with cancer of the calcaneus (the heel bone) and was told surgery and potentially amputation was the only option… However, after the surgeons contacted experts from Australia’s Commonwealth Scientific and Industrial Research Organisation (CSIRO), it was clear there might be another option in the form of a 3D-printed titanium heel bone. Australian company Anatomics was brought on board to oversee the manufacturing of the heel implant, in order to make sure the titanium heel would be able to make smooth contact with bones and enable adhesion of the tissue. Chandler received the titanium heel bone implant in July and is recovering nicely, only 4 months removed from surgery. Reports are that Chandler is now able to put weight on his heel again, another huge breakthrough for 3D printing.